"When our society is so chaotic, why is our crime so organized?" It might be really hard to understand modern Russia without knowing a little bit about the "Mysterious Russian Character" and the Russian lifestyle formed as a result of centuries of slavery, restrictions and lawlessness. The earliest Russian society formed approximately between the 9th and 11th centuries A.D.. This society consisted mainly of thousands Slavonic peasants ruled by the chiefs most of whom had strong Scandinavian background. That society was very similar to early feudal Gesellschafts of Western Europe but in one aspect differed from them greatly. The important difference lay in the fact that in Europe urban communities tended to form independently of the feudal seigneurs and European towns were usually built at a certain distance from the lords' castles. Thus European urban communities protected by walls and towers not only from foreign enemies but also from the neighbouring lords, became a sort of enclaves of early free-market economy and democracy, as well as shelters for free citizens which were the predecessors of modern middle class. In medieval Russia just on the contrary, most of the towns arose around the chiefs' castles (or kremlins) and the urban communities were totally dependent on lords and absolutely unprotected from their despotism. In other words the societies of most fo the early Russian states consisted mainly of warlords and chiefs surrounded by relatively small groups of warriors on the one hand, and masses of rural and urban slaves or half-slaves on the other hand. The only exception was the sovereign Russian country of Novgorod in the North of Russia which had formed as a confederation of several free towns and protected lands with the center in Novgorod ruled by the parliament elected by all of the male citizens. The chiefs or dukes (knyaz) were usually hired by the parliament of Novgorod as military commanders only. One more fact which it might be important to note, is that the social contrasts in early Russian states were to a great extent based on ethnic differences. Most of the warlords, as well as the warriors, were Scandinavians or descendants of Scandinavians including such famous princes and rulers like Ryurik, Dir, Askold, Ingvar (Igor) and Olga. Contrary to their Slavonic servants they were bilingual speaking both Slavonic and Scandinavian, and even the major Russian towns among the chiefs were given Scandinavian names of Holmgard (Novgorod), Kengaard (Kiev), Adelgyuborg (Oreshek), etc...(The above-mentioned fact has been traditionally hushed up by official Russian historians). The conversion of Russia into Byzantine Christianity in 988 created the clerical part of the elite most of which was Greek-speaking, thus also being foreign to dependent Slavonic masses. The political cataclysm of the early 13th century connected with the Tatar-Mongol invasion put Russian peasants and townspeople under the double yoke of their old masters and new Tatar-Mongolic occupants. All Russian states but Novgorod lost their political independence, and along with serving their regular feudal duties for their home seigneurs and feudalized Orthodox monasteries, all representatives of dependent groups and classes of Russian society had to pay the high tribute to the Kypchak Empire into which they had been incorporated as a result of the conquest. That regular financial burden was so hard that thousands of impoverished Russians unable to pay it with goods or money were forced to pay by giving their wives and/or children into Tatar slavery. The tradition of using people as goods (including selling the family-members) arose and deeply rooted in the public consciousnessduring 250 years of Tatar-Mongolic rule and was still accepted as normal even after its end. Those Russians who proved to be unable to accept it had to die or to flee westwards to Lithuania and Poland. The ruling class of Russia escaped paying the tribute but in its turn it was forced to accept new and formerly unknown traditions of public humiliation. For example Russian dukes and governors had to drop themselves down to the ground in front of the representatives of the Kypchak Empire and remain lying untill the permission to get up was given. The procedure of granting the title of the Great Prince of several Russian principalities serving as the governor in the name of Yl-Khan (the Emperor of the Kypchak Empire) was also very characteristic of that period. According to the Kypchak tradition the new Great Prince of Russia was to crawl about forty meters on his belly towards the throne of the Yl-Khan, then catch the Yl-Khan's Charter (Yarlyk) by the mouth and crawl back with the Charter between his teeth. One should also mention that to obtain that high position Russian princes had to spend years bribing the counsellors and favorites of the Yl-Khan as well as their wives and relatives giving to them sumptuous presents in the form of precious stones, furs, horses and... slaves. It is unnessessary to mention that those Russian noblemen who were not ready to accept the new style had to choose between the death and emigration. In the middle of the 15th century the period of the "Tatar Yoke" was over but it nevertheless proved to be determinative in the later development of Russian society. The elements of Kypchak customs, law and government made their influence felt even in modern Russia. According to many Western and Russian sociologists such traditional sores of Russian society as for example corruption, nepotism and cringing go back to the period of Kypchak-Tatar rule. The period between the 15th and the end of the 19th century in recreated Russia was marked by the development of half-slave, half-feudal society with a strong tendency towards further restriction of personal freedom of all the social classes but the thin stratum of noblemen. The territorial grouth of state also served to reinforce the system. In 1478 armies of Moscow Czar Ivan the Great conquered the Novgorod Republic which had been the only remaining enclave of relative freedom within Russian lands. That conquest was accompanied by horrible massacres of the free population of the absorbed republic. The amount of massacred people was so great that Russian (Moscow) soldiers finally found themselves out of arrows and bullets and had to kill thousands of armless people with clubs and swords or drown them in rivers. Depopulated former Novgorod lands were later resettled by peasant-slave families from Central Russia. That was the way Russian rulers were treating those who dared to oppose slavery. If we quickly glanced through the history of Russian society since that moment till the year 1861 when the emancipation of peasant-slaves was decreed by Emperor Alexander II we could notice all the horrors similar to those described by the critics of slavery in the Southern States of the USA and even more. By the middle of the 18th century Russian peasant-slaves or serfs were officially brought down to the status of goods and agricultural implements with human faces. They were deprived of all social rights including the right to move from place to place and even marriage without permission of their master (barin). They could be sold, bought, changed or granted. If some noble master had financial problems he could sell one of his serfs in one part of the Empire while the members of that serf's family could be sold to other parts of that enormous country. Let me now adduce just one illustration: in the middle of the 19th century in Moscow there existed one popular private theater which had one peculiarity: all the admired actors and actresses there came from the families of peasant-slaves. And...finally when their owner got into trouble they were sold by auction. A typical event for that society... There was a number of other traditions which might have seemed terrific even for the slave-owners of Southern Confederation. For example each barin had legal right to spend the first night with all the brides of his serfs. In some villages peasant-slave women were forced to breastfeed her barin's gun-dog puppies... The important thing is that all that was regarded as normal by Russian society of that time including both the serfs and the noble serf-owners. Seldom and unorganized uprisings of serfs used to be cruelly repressed. The attempt of military coup d'etat organized by few noble abolitionists in December 1825 received no support from serfs and failed as well. One may ask: why did not peasant-slaves try to escape from their country? The unswer will be very easy. Their country was too large and well controlled by police forces, and Russian peasant-slaves were not familiar with geography and simply did not know were to flee. In spite of that priests of the official Russian Orthodox Chirch taught them that slavery was their God-given destiny and any attempt to change it was regarded as sin. The expansion of Russian Empire led to the expansion of slavery in acquired territories. For certain parts of the country there was however made an exception. For example Caucasus, Baltic provinces and a small part of annexed Poland managed to preserve their own feudal or semi-feudal codes of law according to which dependent peasants nevertheless "enjoyed" certain rights, tiny-populated Siberia was turned into a punitive territory (something like French Guiana) mainly inhabited by convicts and soldiers, and several Cossack regions in Southern Russia and the Ural Mountains developed as isolated enclaves of relative freedom. The first Cossack regions formed between the 14th and 18th centuries on lonely borderlands settled by runaway serfs, organized brigands and other warlike adventurers mainly from Russia and Ukraine. The first settlers calling themselves the Cossacks (a Turkish word meaning "the dare-devils") created a specific societies combining cult of violence and unrestricted freedom with elements of democracy and elementary law. Forming mobile rural communities the Cossacs earned their living mainly by making plundering raids on neighbouring lands at that time belonging to Turkey and Iran. During those raids they often created families taking their future wives as a part of loot. After a number of unsuccessful attempts of turning Cossacks into serfs the rulers of growing Russia finally granted them a special status within Russian Empire. The Cossacs in turn were obliged to defend Russian frontiers from the neighbouring countries. Later on when the frontier moved further South- and Eastwards the Cossacs were transformed into privileged militia serving as elite troops and high-professional geandarmery. Coming back to the ruling class one should also keep in mind that from the end of of the "Tatar Yoke" till the Revolution of 1917 Russian elite was an object of at least two radical purges. The first one took place during the rule of Ivan IV The Terrible (1547-84). That Czar aimed at destructing old and powerful boyar clans and weakening the power of chirch in order to consolidate his autocratic position. Preventing both real and potential plots Czar Ivan resorted to torture, exile and execution of the whole boyar families whose ancestors had originated from Scandinavian chiefs of ancient Russia. To fill the vaccuum created within the ruling class Ivan the Terrible generously cinfered noble titles to the members of his personal police force (oprichniki) and even to the most loyal palace- and hunting servants. That process resulted in the formation of a new Russian elite called dworyanstwo. The rule of Ivan the Terrible changed the meaning of this Russian word: before the purge of 1564-84 the word dworyanstwo had been used to define servants while afterwards it became the synonim of aristocracy or nobility. The second purge of nobility came the reforms of the first Russian Emperor Peter the Great (1689-1725) and his policy of Westernization. Deposing his opponents, Peter the Great encouraged immigration from Western Europe (particularly from Germany) and thousands of those foreigners (especially technical and military experts) were granted Russian noble titles as a reward for their services. By one of the Emperor's decrees all noblemen were obliged to serve in the Army, Navy or Civil Service. Those who did not want to serve were immediately deprived of all their privileges. Trying to reinforce the slavery and further restricting personal freedom of all Russian classes Peter the Great however tended to ennoble some talented representatives of the lower classes of society. Several decades after the death of Peter the Great the law of obligatory service for noblemen was repealed and the class of slave-owners started rapidly degrading. By the beginning of the 19th century an average aristocratic family had owned a number of villages inhabited by dozens of serfs (the amount of villages could vary from one to several hundreds) and a big piece of cultivated land (varying from 1000 acres to hundreds square miles). Slave labour and export of agricultural products was the pledge of prosperous and even luxury life making education and successful carreer orientation absolutely unnecessary. The daily life of most of Russian noble landowners was full of idleness. A rural Russian barin normaly rose at noon to have a lavish breakfast. Then he could enjoy a horseback ride or just a walk around his estate. About two o'clock PM was the time of dinner after which he could either go to bed for a couple of hours or spend some time reading and smoking pipe sitting on the veranda. Then followed traditional Russian tea with jam and cakes and after a short break came an abundant supper with liquors, wine and vodka. Conversations centered mainly on hunting, local rumors and sometimes agriculture and politics and were held in French or German more often than in Russian (either because of ethnic origins or due to traditional admiration for everything believed to be "western"). In winter time land-owners' families tended to move to their urban residences where their safe but monotonous life was relieved with balls and theaters. Some bored young aristocrats turned to cards, lechery and other vices squandering enormous fortunes and going down to the scum of society. Others just vegetated from generation to generation loosing their intellectual and genetic potential. Of course a certain amount of noble Russian youngsters devoted their lives to Civil service as well as arts, literature and sciences but they were unable to change the situation in the country either because at that time in Russia there was absolutely no deliberative institution even for aristocracy and all the decisions were made only by the Emperor influenced by a restricted circle of advisers and favorites. One should also know that in Russian military and civil service there was a lot of impoverished noblemen who tried to improve their financial situation through bribery and embezzlement of state funds (the tradition dating from the epoch before Peter the Great when bureaucrats received no salary but instead of that they were legally allowed to "feed" themselves taking bribes). Another group of impoverished noble youth (among them many students) totally unsatisfied with their social status tended to organize into different revolutionary and terrorist groups where they blocked with some angry intellectuals discriminated for not belonging to aristocracy. Anyway, during the 19th century Russian semi-slave society was rapidly degenerating and the Empire needed drastic reforms just to survive. The reform process started during the rule of Alexander II The Liberator (1855-81) but was interrupted after the assassination of the Emperor by terrorists in 1981. However during the short era of reform slavery was abolished, millions of serfs forming more than 80 per cent of Russia's population were at last emancipated and the Empire although far from being constitutional state started slowly developing in the direction of relative freedom. Nevertheless Russian Empire was doomed. Various social problems caused by the unfinished reforms, lack of democracy, degradation of the ruling class, weakness of the scanty middle class which only started forming by the end of the last century - all that was used by radical revolutionaries who accepted some West-European socialist ideas, worked them into their own dogma and finally siezed power in 1917. After the "Socialist" revolution and 5 years of bloody civil war Russian Empire was turned into the so-called USSR (Union of Soviet Socialist Republics). Caste Segregation during the Period of "Socialism"
Immediately after coming to power Russian revolutionaties calling themselves bolsheviks (later - communists) declared abolishion of all classes and estates and proclaimed the Proletarian Dictatorship as the first step towards the construction of "Prosperous Socialist society". However all their ideological slogans proved to be demagogic and deceitful from the very beginning. From the first hours of their rule bolsheviks organized mass murder of those whom they called "belonging to the exploiter classes". During that campaign often called the Red Terror there were killed or imprisoned millions of former aristocrats, officers, priests, enterpreneurs and simply well-educated people sometimes together with their wives, children and relatives all their property having been confiscated by the authorities. Many of those members of "exploiter classes" who survived that first radical purge of Russian society and did not flee the country remained having a special punitive status (lishentsy) untill the late '50'ies. Sometimes the whole ethnic groups became victims of bolshevik atrocities for unwilling to accept new ideology. For example when Don Cossacks were defeated after three years of valiant but futile resistance, the victorious revolutionary army kept executing the whole communities. It seems important to mention that only a small part of bolsheviks (99 per cent of whom had by the way belonged to the "exploiter classes" themselves) seriously believed in their fanatic ideology. Most of them having been for various reasons unsatisfied with their position in pre-revolutionary Russian society were cold cynics capable of doing absolutely anything to satisfy their personal ambitions or aiming at power and wealth. This fact explains their cruelty and indifference not only towards their noble and middle-class opponents but also towards peasants and factory workers whose interests they officially represented. In the early '20'ies the communists nationalized all private industry instead of transferring them into posession of workers as it had been promised at the beginning of the civil war. During the early '30'ies all agricultural lands were nationalized as well. Thus Russian peasants were deprived of their right for land-owning in spite of popular revolutuonary slogan "All the lands into the Peasants' hands!". Actually by the end of the '30'ies Russian peasants were to a certain extent turned into serfs again: they were forced to work on the state-owned collective farms without getting any wages, their freedom of moving to the cities or other regions being restricted, just like in pre-reform Russian Empire. Several peasant uprisings against the communist government ended with mass murderings and deportations of "irresponsible citizens". To rule the enormous country more or less successfully Russian communists had nothing to do but to develop a kind of new ruling-class and by the end of the '20'ies new "Soviet" elite was formed. Called by most sovietologists Nomenclatura this upper caste of the USSR consisted mainly of high-rank functionaries of the ruling Communist Party (serving as the basic ruling body of the country) as well as high-rank representatives of Army and Security forces and finally a very restricted circle of scientists, writers and artists serving the interests of state defense and ideology. Everything around Nomenclatura was marked with hypocrisy and lie. For example all Soviet mass media as well as other instruments of propaganda kept systematically convincing the population of the legend that neither Communist Party bosses, nor any other high-rank Soviet officials occupied any kind of privileged position in the society of "universal equality". However all the representatives of Nomenclatura as well as their spouses and children enjoyed living in luxury state apartments and dachas, possessing comfortable limousines, etc. what was absolutely inaccessible for ordinary citizens. The undeclared ruling caste also had such privileges as access to special stores where high-quality food and western goods were sold at reduced prices, special medical and dental care (both of them free), exclusive rights for possessing hard currency and going abroad for vacation and treatment, etc. One might say that all the above-mentioned can not be classified as benefits just because for example enjoying high-quality medical care or spending vacations abroad is normal in any more or less developed society. But one should bear in mind that in communist Russia (from 1922 to 1991 in the USSR) with its uneffective economy the possibilities open for Nomenclatura were a real luxury while at the same time the state calling itself "Socialist" was unable to provide satisfactory living standards for the majority of active population. From the point of view of socialist dogma one should also mention that although all spheres of life in the USSR were strongly marked with communist ideology, Nomenclatura itself did not believe in it and pursued the corresponding policy only symbolically including the ceremonial procedure of granting membership in the Communist Party. The ruling "red bosses" never regarded such socialist theories as those of equality or compulsory compensation for work as something serious and worth turning into life. During the last decade of communist regime the represenatives of Nomenclatura even started calling themselves "full members of the society" (Polnoprawnyje) while all the rest of Soviet citizens were called "the population" (Naselyenije). The representatives of Nomenclatura could use those words only among themselves in such a stories as for example: "Yesterday I happened to eat a piece of sausage produced for the population and now I have a stomach ache..."
To join nomenclatura was very difficult because the country's ill economy gave no possibilities to keep numerous elite. But even if one had managed to join Nomenclatura his (or her) life would have been far from being easy: all spheres of their social life and behaviour were strictly regulated including private contacts, marriages, and even clothes and diet. Jokes or smiling were absolutely unacceptable and office servility was comparable maybe to that of Kypchak Empire. In addition to that Soviet Nomenclatura was an object of several drastic purges. The first one took place in mid­-'30'ies when thousands of Communist Party, governmental and military bureaucrats supposed in opposition were imprisoned, exiled to Siberia, or executed after cruel tortures. Most of their family members, relatives and even friends were imprisoned as well. Two more purges of upper caste were organized immediately after the end of World War II and in mid­-'50'ies although they were less cruel. And even afterwards each and every member of Nomenclatura lived under threat of getting out of favour and loosing all their privileges. Not the best life. Soon after the communists had firmly established their power in Russia the majority of ordinary "Soviet citizens" fell under the heavy burden of various restrictions keeping them under total control and prescribing all possible details of their way of life. The masses were absolutely deprived of any possibilities of taking part in ruling their own country. In spite of the fact that in communist Russia there nominally existed a kind of ersatz-parliament (under the name of the Supreme Soviet) and numerous regional Soviets serving as elective bodies all the candidates represented the CPSU (The Communist Party of the Soviet Union) which was the only legal political party of the country. Furthermore, Russian voters were offered to vote for only one candidate without any alternative even within one party. The candidates themselves were usually nominated by the upper bodies of the Communist Party and approved in most cases anonimously at special party meetings. "The Population" was also deprived of all political freedoms and any kind of protesting was illegal and punishable. At the same time highly developed and intensively working means of Communist propaganda kept persuading masses that the "Soviet society" was the most democartic one and that people did not need any political freedoms just for the reason that their society was ideal and thus could not serve as an object of any changes or criticism. Financially "the Population" was also cut down by the legal system of maximum wages and salaries which did not depend on inflation rates and finally led to the total impoverishment. Trying to improve their financial situation millions of Russians were turning to different kinds of illegal activities. One should know that in the USSR illegal were not only such criminal deeds as murder, robbery or theft, but also all kinds of free enterprise, operating with any amount of foreign currency and even working at two or more different places. The infringers were subjects of legal persecution facing from 8 to 15 years of imprisonment and confiscation of property. During the period of communist rule Russian prisons and the so-called "Labor camps" were always full as a result of numerous violations of law often committed just for survival. One more feature characteristic of prisons and other penitentiary institutions of the USSR was that they have always been (and still are) part and parcel of the country's industry. Millions of prisoners (zeki) have been working for nothing about 10-14 hours a day producing clothes, footwear and a number of other articles proping the ill national economy up with there slave labour. There was also a great number of other restrictions in the USSR imposed on normal citizens which may seem coming from science fiction for those grown up in democratic societies. For example for those belonging to "the Population" it was absolutely impossible to get high-quality medical or dental care even if they were ready to pay money for that. Good hospitals and dental centers for everybody simply did not exist in the country. Enjoying them was a privilege for Nomenclatura. And if some doctors or dentists were trying to help people privately it was qualified as bribery and was thus punishable. Leaving the country even for vacations was also a privilege absolutelu inaccessible for the majority of "Soviet people" and travelling across the country was limited as well through the total absence of hotels. Actually in every big city there officially existed a couple of big state-owned hotels, but they were allowed to open their doors only for western tourists or for those travelling on official business. Moving from one part of the country to another was illegal as well. In all big cities of the USSR there existed the sytsem of residence permit (propiska) without which nobody was allowed to stay and work in the city. The permit was normally granted to those who were transferred there by the decision of their state employers. One more typical feature of the live of "Soviet citizens" was the lack of available dwelling space. All the housing was owned by the government and no ordinary citizen was allowed to purchase a house or an apartment. Private renting was also illegal. In other words one could only "receive" some dwelling space from the government or regional Soviet keeping in mind that the official dwelling norm for "the Population" was 4 square meters per capita. Thus a family of four or more persons could "enjoy" one bachelor apartment without any hope for gaining something better. Until the end of the '80'ies more than 50 per cent of "Soviet people" lived in the so-called "communal" flats (kommunalka) in which there was a number of rooms each of which was occupied by one family with one joint kitchen and joint toilet facilities. Generally speaking that was the lifestyle which communist propaganda called "Developed Socialism". To keep the masses of discriminated population under control the ruling Communist Party certainly needed a well-organized and highly qualified repressive services which were created during the first months of communist supremacy. Several times have the secret police departments of communist Russia changed their names and structures (in some special literature one may run accross such abbreviations as for example CHeKa, NKVD, MGB and OGPU) their staff members having been objects of several purges. But finally to the end of the '70'ies there have been formed two main "special services" (or "systems" as Russians called them) namely MVD and KGB. The first one concentrated mainly on criminal and financial investigations while the second one constituted an enormous and ramified secret police including intelligence, counterintelligence and many other services penetrating all the groups of "Soviet" society. It may seem strange but membership in KGB and MVD was a longed-for dream for many young Russians because of different privileges granted for the full- or part-time participation in their work. Of course the benefits of secret service-men and -women were hardly comparable to those of Nomenclatura, but nevertheless they were of a great material significance in the society of total poverty. The "workers of the system" were paid salaries much higher than average. Moreover they were provided with better medical care and allowed to attend special stores where one could purchase goods of better quality than those available in the stores "for the Population". On the other hand the "system-workers" should have been especially careful about their private contacts, behavior and opinions, but most of them tended to accept the strict rules of their team in order to preserve their privileges and keep staying among the shepherds but not in the flock. As long as the so-called "socialist society" started swaying the "systems" had to develop recruiting more and more new members while for the weakening economy keeping such an amount of privileged scroungers was less and less possible. And finally the "socialist society" collapsed giving birth to new social formations and arising new problems. Besides three main castes of "the socialist society" mentioned above there was one more significant social group in Soviet Russia which might be also called "absolutely antisocial". However this group was numerous and had a stable tendency to grow since the early '20'ies. It included millions of criminals who for different reasons did not happen to join either Nomenclatura, or "the Population" and who were also unable to serve in "special systems". This specific group still existing in modern Russia is now exerting significant influence upon the whole life of the country including its economy, and actually this whole book is devoted only to the description of Russia's complex criminal world. The breakdown of the "Socialist Paradise" in August 1991 put an end to all caste privileges and destroyed both the concepts of "Nomenclatura" and "The Population". In the new post-communist Russia all the members of society got equal rights including the right of earning money, which was banned under communists. In accordance with that various people gained various possibilities depending on there financial backgrounds and sources of income. It should be mentioned that modern Russia still has not stabilized after radical political and economical changes and it is still difficult to describe modern Russian society for the reason that it is still going on changing and developing. However it is already possible to figure out at least three main categories of citizens using their average income as the main criterion. They are the so-called New Russians (or just "wealthy people"), then come more or less well-to-do citizens tending to reach the level of the New Russians and finally comes the majority of the nation whose financial situation may be described with one word and that is poverty. According to the latest sociological data this group constitues a little bit more than 1 per cent of the sum total population of the country. An average representative of this group is supposed to have an annual revenue of about $60.000. Not the highest imaginable income by the American standards. Within the "New Russians" there stands out a very small subgroup of really rich people whose income exceeds one million a year, but the number of such persons or families in Russia can hardly reach three thousand. Most of those people started making their fortunes turning to business activities during the years of Perestroyka (1986-91), the period of relative liberalization of Soviet economy and politics preceding the end of communism in Russia. Most of the "New Russians" are coming from Nomenclatura (usually representing its younger generation or being the children of Nomenclatura parents). Having used their privileged status in the "Socialist" society those people were well-informed about new possibilities and had favourable opportunities both legal and financial to concentrate their energy in proper directions and gain most of the possible success at the initial stage of new-borning Russian capitalism. Another much smaller part of the "New Russians" belongs to the "elite" of criminal world or act in close connection with their initial capital coming from criminal sources. The second group which still has no definite name has not reached the average income rates of "The New Russians". Its average annual revenue ranges from $12.000 to 20.000. To this group belong about 5 per cent of all Russians and this number tends to grow on as well as the group's income. Most of those people earn for their living or sometimes survival owing to their skills and education combined with initiative, hard-work and career orientation. Some analysts seriously believe that this group may soon become the kernel of future Russian middle-class unless the country is involved in new social cataclysms. As far as the rest 94 percent of the former "Soviet people" are concerned one should say that their social role and status is still difficult to define. And from the financial point of view their living standards are quite low as it has already been mentioned above. 1. All the activities taking place in modern Russia including those of governmental and business structures as well as of ordinary individuals are conducted mostly by the people having typical Post-Soviet mentality and philosophy. This is one of the unexpected paradoxes of modern Russia. In spite of the fact that this large country is inhabited by numerous ethnic groups with absolutely different cultural backgrounds most of its citizens to a greater or less degree can still be regarded as the bearers of Post-Soviet mentality which finally determines their behavior including taking decisions, the ways and methods of putting their decisions into practice and concluding contracts and agreements. 2. The evolution of human mentality and philosophy cannot go as quickly as certain changes in the spheres of politics and economy. People are changing very slowly, and everybody interested in understanding them, should never ignore that process which in its turn often influences the evolution of economic and political life of society. Contempt for law and legal regulations in general. Soviet Union there traditionally existed two social groups which in fact were out of jurisdiction of the country's current legislation (and to a certain extent this situation still remains actual in modern Post-Soviet Russia). The first group tended to exist and act in accordance with its own unwritten inner code. This referred to the members of Nomenclatura as well as to the millions of "system-workers" (KGB and police-officers) and their family-members. Since political changes of 1991 most of the representatives of that group have entered the new governmental, security and business structures trying to keep traditions alive. The second group used to ignore (and still ignores) all state laws and regulations spontaneously or purposefully, sometimes as a specific form of social protest. This group includes masses of criminals certain part of whom possess their inner codes as well (just like the first above-mentioned group). Another possible reason for generally accepted contempt for law is that many laws and regulations passed during both the communist and post-communist periods were often illogical, did not work in practice and were never approved by any considerable part of the population just for the reason that they were aimed against interests and needs of the vast majority of Russians. Parallelly, almost every citizen of the country beginning with his (or her) childhood could regularly watch various kinds of illegal actions on all the levels of society which however remained unpunished. Legal paradoxes in general have been always characteristic of modern and pre-modern (Soviet) Russia. For example, during the communist rule possessing foreign currency was punishable and at the same time in all big cities of the USSR there existed a number of state-run services and stores which accepted only foreign cash. Another example: nowdays there exists a number of strict regulations concerning the issue of licences for the export of raw materials and mineral resources from Russian Federation. However there exists a number of strange companies successfully operating in the above-mentiond fields without meeting legal requirements for the licencing of their activity. And by the way beginning with the last years of the Soviet regime law-enforcement bodies in Russia started demonstrating more and more tolerance to different offences against the law. One of the reasons for that was the spreading of corruption, another, maybe even more important lay in the imperfection of the country's legislation. personal "social niches" for themselves. Turning to the "social niches" placing their "owners" out of law or to be more exact out of its restrictive framework we have to come back to the two above-mentioned social groups (the ruling-caste and the criminals) more or less independent of Russian legislation. The first one has for a long time been "legally" placed out of law, while the second one happened to be there illegally either on ideological, or on financial purposes (sometimes even on both of them simultaneously). As a rule in most of the societies of our world these two groups occupy absolutely polar positions. In Russia however they have been for a long time tending to draw together and sometimes even cooperate. As a result of this social phenomenon the upper structures acquired a kind of criminal style and character, while different criminal groups gain more and more power though unofficial, but nevertheless quite real. At the same time all social strata engaged in industry, science and arts and still to some extent obeying the law and bearing the heavy burden of providing for both their rulers and criminals, are turning into half-slave masses again. Parallelly the working strata are becoming thinner because more and more individuals are tired of doing their jobs for nothing as compared with the incomes of those out of law. Hence they are potentially ready to join the criminal world at any moment. 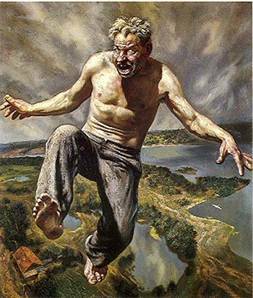 This element of modern Russian (Post-Soviet) mentality may have appeared for the reason that for a long period of time (at least between 1918 and the end of the '80'ies) in the Soviet Union there was a striking disparity between the real life and its description spread by Mass Media and other means of communist propaganda. Possibly as a result of that the word "No" in nowdays Russia just like in the former USSR does not mean the real "No". Actually in all social institutions with which "Soviet people" (and foreign visitors) have had to contact during their everyday life starting with governmental offices and ending with consumer services the answer "No" usually meant "No, but...". This very special "No" could quickly turn into "Yes" and every negative answer could immediately become positive if the applicant was able to show a kind of "social certificate", that is unofficial but nevertheless deadly real membership of the "group of possessors", i.e. the possessors of power, special privileges, big money or other possible values of the society in question. Nowdays Russian society is changing but it would be an exaggeration to say that the described social phenomenon has already disappeared. As a result of such an experience the mendacity in Russia is regarded as one of the norms, and many people do not find it immoral to say or to write something which is not true, or at least not quite true. Of most of modern Russians it is also quite typical to perceive any text very specifically, with a number of significant and hardly forseen deviations of its real sense. Speaking of this particular feature being one more reason for the spreading of Russian criminality and the low quality of the country's production one should mention two facts which may be the reason for its existence. First we should keep in mind that during hundreds of years including the last decades Russian producers were not receiving even minimal living wages. As a result they simply could not appreciate either the products of their own work or any products of labour as such. During the period approximately from 1920 till 1980 the term "Professional" has been constantly used in all means of official Soviet propaganda as a negative word thus forming a corresponding negative stereotype of mass consciousness. The word "Professional" often meant someone who was not "taking enough part in social work" and overestimated himself. In most cases the successfull career in the Soviet Union could be reached not through the development of one's professional skills but through the so-called "social activity" (i.e. one should have been "a proper communist"). Thus high-quality labor in Russia had zero price. One should also add to the above-mentioned that during the Soviet period high-quality workers were usually encouraged to forget their professional experience but start political career. Sometimes they were also recruited into secret service and punitive bodies. Both two variants were synonims of earning more or less good money and of certain security of those people and their families. One of the most negative if not say tragic result of all those processes was the working out of negative attitude towards the concept of work as the main basis of human life. Many Russians still believe that work is the lot of the worst people and the lowest strata of society. And the capture of products of someone else's work has become one of the social norms. This is also one of the excuses for modern Russian criminals and even one of the reasons for the most recent political changes. Being aware of all above facts should help us to understand Russian Mafia and its background. Now let us take a quick look at the history of Russian underworld.